French sculptor. His family were functionaries associated with Nicolas Fouquet, Louis XIV s Minister of Finance, and were ruined by his disgrace. He trained first with the painter Pierre Mosnier, and in 1684 he entered the studio of Franois Girardon, where he worked under his orders on the execution of the tomb of Cardinal Richelieu (marble, c. 1683-89; Paris, Church of the Sorbonne). He later returned to help Girardon as the principal executant of Girardon s memorial to his wife, the flower painter Catherine Duchemin (marble, c. 1703-07; Paris, Ste Marguerite). 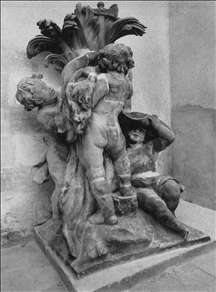 In 1689 Le Lorrain was awarded the Prix de Rome for his relief of the Drunkenness of Noah (untraced) and arrived at the Acadmie de France in Rome in 1692. Financial constraints and Le Lorrain s difficult character led to the withdrawal of his grant two years later. He worked briefly as an assistant to the French sculptor Jean-Baptiste Thodon before returning to Paris. He left behind in Rome an unfinished marble medallion of Christ in Benediction (Rome, Palazzo Montecitorio). Back in Paris, he gained some private commissions and joined the Acadmie of Saint-Luc, because the Acadmie itself was taking no new members and official commissions were few. 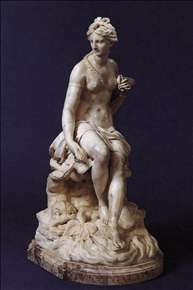 Only in 1701 was he received there, on presentation of the marble Galatea (Washington), signed and dated that year, and intended as a pendant to Van Clève s Polyphemus. He worked for the Rohan-Soubise family, and employed by the Cardinal de Rohan at the chateau of Saverne, for some six years from 1717. Unfortunately, the complete salon he decorated there, under the direction of Robert de Cotte, was destroyed by fire well before the end of the century. The cardinal employed him again in the years 1735-38, this time in exterior decoration of his huge palace at Strasbourg. Apoplexy cut short Le Lorrain s work at Strasbourg, though he seems to have continued to model in Paris. 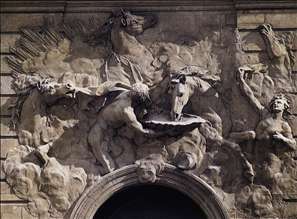 In his old age, probably around 1736, he created his masterpiece, the Horses of the Sun relief, as decoration of the stables of the Hôtel de Rohan. He exhibited in the Salon, two small terracotta genre groups ( des Jeux ) in 1725, and two terracotta goups ( Groupes de fantasie , lost) in 1737. See more details about "Group of Children"
See more details about "Galatea"
See more details about "The Horses of the Sun"